Jay was top notch. He let me know that my dishwasher had been incorrectly installed and all of the things that were not done correctly. Was a warranty call but Will definitely use this company for other services because the guy who serviced was so kind and communicated with us. Hard to come by good quality workers these days so we were impressed by him. Lucas did an excellent job! 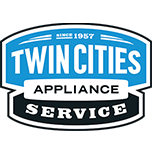 I really appreciate the professionalism and skill exhibited by Lucas from Twin Cities Appliance. He repaired our refrigerator quickly and left everything looking better than it looked before he arrived. REFRIGERATOR WHIRLPOOL MFC2062FEZ01 "Unit making a loud rattling noise while running. Found freezer door not closing properly. Caused ice buildup around freezer fan blade, fan grille cover out of position. Repositioned fan cover and adjusted door rails. Remounted door and leveled unit. Doors now closing properly, noise levels normal." DISHWASHER WHIRLPOOL WDT970SAHZ0 "Cust had had unit removed for new flooring and cabinets. Company that reinstalled the unit did not install correctly. Tub is in crooked so door will not close all the way, the top left corner of the door is hitting the tub. Screws holding brackets to side cabinets are not Philips head screws, cannot get them out, and covers to go over the holes are missing. Electrical box underneath not attached correctly. Issue is not a warranty issue, cust has to go back to the company that did the install"
REFRIGERATOR WHIRLPOOL WRS325SDHZ02 The water dispenser drips after pulling the glass away. A few drips after removing the glass is normal but on this model it does not catch in the drip tray. The dispenser tube is so close to the edge that it misses the tray and drips down the front of the refrigerator. I tried moving the tube back a bit but it still misses the tray and runs down the front. This water running down the front has caused staining on the stainless steel. This is an issue in the design. Customer is going to call customer service. MICROWAVE WHIRLPOOL WMH53520CS2 "Magnetron failed, all ops good except not heating. Pulled microwave down and installed new mag. Tested, now heating normally"
REFRIGERATOR WHIRLPOOL WRF757SDEM01 Installed new led board. Operation tested good. REFRIGERATOR WHIRLPOOL WRS325SDHZ01 Checked all components for noises out of the ordinary but did not find any. Compressor and both fans sound normal. The damper is extremely quiet. REFRIGERATOR WHIRLPOOL WRS325SDHZ01 Condenser coil rattling against the cardboard shield. Operation tested good after adjusting. REFRIGERATOR AMANA ASI2575GRS00 Installed new filter housing. Operation tested good. WASHER MAYTAG MVWB835DC4 "8-1, floodsafe line on hot side tripped and bad, replace hoses, calibrate, run test cycle, ok; used 1 8212545RP (HOSE KIT) from stock"
REFRIGERATOR WHIRLPOOL WRV986FDEM01 "Installed new control, user interface, and ice box fan. Operation tested good." REFRIGERATOR WHIRLPOOL WRF954CIHM00 "Icemaker fill tube heater wires broke, caused fill tube to freeze up and icemaker to quit making ice. Ordering fill tube. ; ordrng 1 W10917894 (FILL TUBE)"
REFRIGERATOR WHIRLPOOL KFIS25XVMS9 "Installed new icemaker and cycled, fill normal, all os good; used 1 W10882923 (ICE MAKER) from stock"
WASHER MAYTAG MVWB765FW0 "Leaking fab softer when pushed all the way in before washing, order housing and draw do not need valve..; ordrng 1 W10919352 (drawer) and 1 W11172234 (HOUSING)"
DRYER WHIRLPOOL MEDX655DW1 "Remove screw from felt seal, smell from painting"
REFRIGERATOR WHIRLPOOL WRV986FDEM01 "Ice box fan not moving enough air. In diagnostics the fan just kept pulsating. Needs new fan, control and user interface. ; ordrng 1 W10846539 (ICE BOX FAN) and 1 W11036562 (ICE BOX FAN) and 1 WPW10675033 (CONTROL)"
WASHER MAYTAG MVWB766FW0 "3-2, gearcase noisy, call when coming back; ordrng 1 W10811956 (GEARCASE) and 1 W11165546 (VALVE)"
WASHER MAYTAG MVWB765FW0 Install all parts check over unit tested out good ran diagnostics went thr fine..
DRYER WHIRLPOOL MED8200FC2 "Tighten screws around element, if keeps up order new element and heater box"
MICROWAVE WHIRLPOOL WMH53520CS Install door kit check over unit tested out good..
WASHER WHIRLPOOL WFW85HEFW1 "Ran diagnostics, no error codes found, ran diagnostics through ok, all valves ok, functions ok, spins ok, inst cust using only 1-2 tbsp of soap and not only wash a few items or too light of a load, this will cause unit to go off balance, unit needs a full load to operate correctly, hi speed spin ok, showed customer how to change spin speed, inst cust on delicate cycle spin speed is slow and clothes may be wet or damp at end, can always run an extra spin cycle if clothes not spun out enough to liking, unit functioning as designed"
REFRIGERATOR WHIRLPOOL KFIS25XVMS9 "Icemaker stalled out, removed ice bin and checked icemaker. Heared air circ7lator fan running, ususally not running when icemaker bad. Unplugged icemaker then plugged back in, icemaker started to cycle. Went all the way theough and filled with water. Gave cust estimate for icemaker w10882923 with labor charge of 85.90. Cust wants to wait and see if icemaker continues to cycle, if not he will call us"
REFRIGERATOR WHIRLPOOL WRS325SDHZ02 Customer stated when opening the doors the unit rolls out a bit. It does not have floor anchors on this model. The only way to stop this would be to crank the front rollers up. Customer wants me to leave it where it is. MICROWAVE WHIRLPOOL WMH53520CS "Open door error, Found bad switches, needs switch kit, kit backordered office to follow up with customer ; ordrng 1 W11244490 (KIT)"
OVEN WHIRLPOOL WGG745S0FS02 "Getting voltage from the switch harness into the module but no spark. Needs new spark module. ; ordrng 1 74009098 (module,spark) and 1 SHIPTOTECH (SHIP TO TECH)"
REFRIGERATOR KITCHEN AID KRMF706EBS00 Installed all 4 control boards. Operation tested good. WASHER WHIRLPOOL MHW8200FC0 Installed new tub assembly and ran a diagnostic cycle. In the high speed spin there is still a slight squeaking noise. The noise is coming from the storage drawer. Customer will put some items in the drawer to weigh it down. STACKED MAYTAG LSG7806AAQ Install lid lock check over unit tested out good..charge lid lock only..